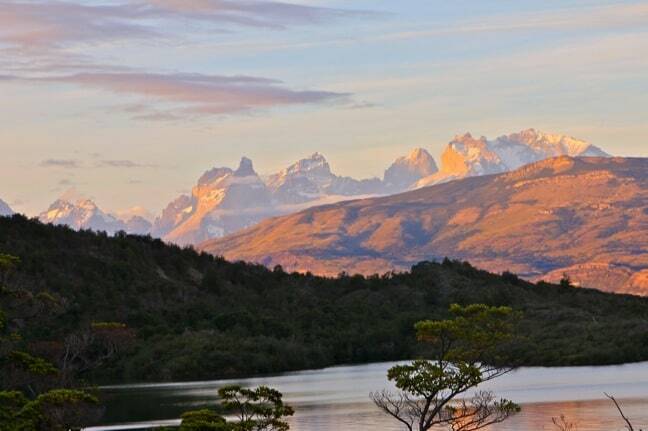 We’re sitting in the back seat of a 4WD van, making our way north from the port town of Punta Arenas to Patagonia Camp, an upscale eco lodge set along the shores of Lake Toro, on the outskirts of Torres del Paine National Park. Rolling hills of multi-hued tundra dappled with subtle earth tones pass by just outside our window: It feels like traveling through an impressionist’s artful dream. The clouds are rich with an almost surreal depth of texture, mirroring vast herds of fluffy sheep that rest in the midday sun. Endless miles go by without a single sign of human habitation, save for the ubiquitous wood and barbed wire fences that section off wide expanses of unspoiled acreage. There’s a stark sense of isolation here, yet the fabled Chilean Patagonia region offers plenty of earthy comfort, color and light. Abundant lakes nurture nature against the harsh, arid climate. 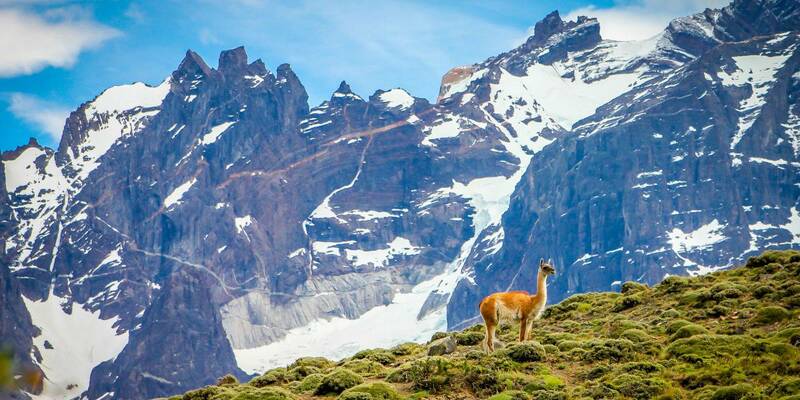 We see Guanacos (a.k.a. 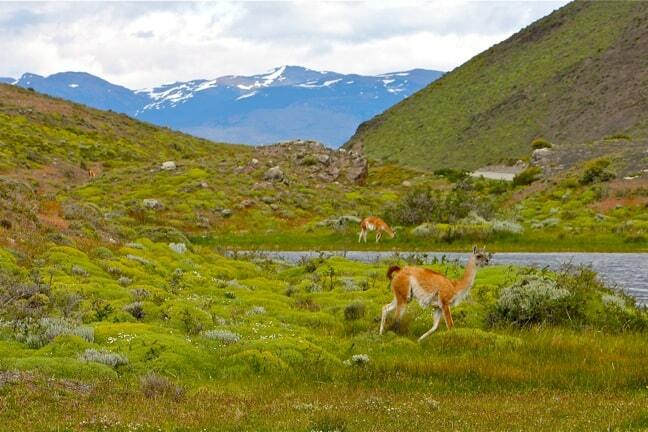 Patagonian llamas), herds of horses, and groups of gangly Chilean ostriches roaming the open plain. The predatory birds known as Caracaras line the road with such increasing frequency, I begin to imagine them as the handsome welcoming guard to some grand Narnian castle. 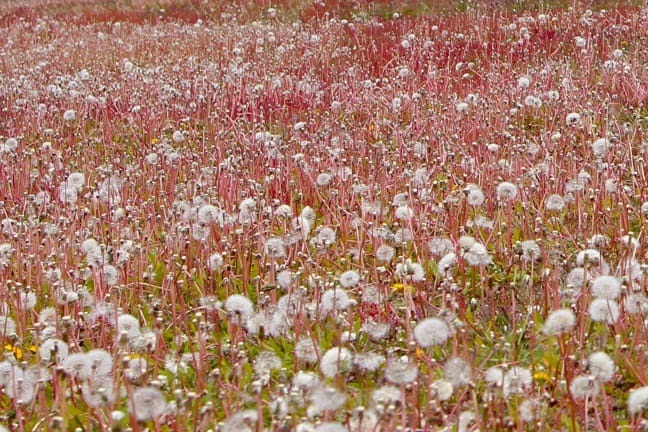 We stop at a picnic area surrounded by a lush carpet of dandelions, relieving our bladders on lichen-covered Lenga trees stripped nearly naked of leaves by the chilling wind (which can blow at gusts of up to 100 mph). 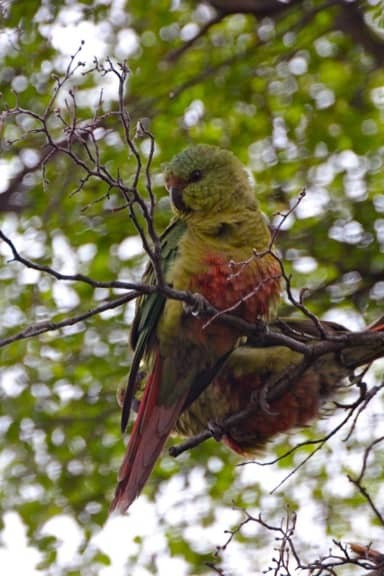 As our guide, Santiago native Matias Espinosa, prepares a snack of hot tea and alfajor (delicious dulche de leche cookies), a flock of 6 brilliant green Austral parakeets flies over and lands on a tree nearby. As always when we travel, we find kindred spirits among those who love nature, sharing a mutual appreciation for the myriad complexities of seemingly simple things. Matias, at age 28, has left behind a 12-year career as a professional surfer to pursue a degree in Ecotourism. Though he still chases waves for personal pleasure from time to time, he’s working at Patagonia Camp to get some experience in the field before completing his final thesis on making national parks more accessible for disabled people. From massive rock formations known as “The Devil’s Chair” and “The Castle” to expansive fields of wind-blown grasses that look like shimmering waves on a sparkling green ocean, everything we see on the road to Patagonia seems somehow larger than life. Even tiny flowers such as 7 T-Shirts (escallonia) and Fire Bush (notro) boast impossibly brilliant colors, as if Mother Nature decided to crank their saturation levels up to 100 so that they could better compete with the picturesque scenery for our attention. I won’t repeat the expletives I uttered the first time we rounded a corner to finally see the mountains of Torres del Paine revealed in all their glory. But suffice it to say that they were awe-inspired exultations of slack-jawed wonder. There’s something about the iconic Paine Massif that’s much more monolithic and majestic in person than even the finest picture postcards can suggest. I felt truly humbled by its sheer grandeur.